One of the most powerful feature of RTC is the ability to run in the lowest power mode possible on the ATSAMD21G18A-AU microcontroller. This allow the Mini Ultra Pro board to reside in ultra low power mode (21 µA or less of current only!) majority of the time and wake up upon alarm triggered by the RTC to perform scheduled tasks (sensor reading, data logging, radio communication, driving an actuator, etc). Putting the Mini Ultra Pro into sleep mode (known as standby mode on the ATSAMD21 microcontroller series) will essentially stopping the main clock from running (which is also used to derived other clocks to drive peripherals). The important aspect of putting the Mini Ultra Pro into low power mode (a.k.a. sleep) is more than putting the microcontroller into standby mode. Identifying circuit components that could be driving excessive amount of current even when not in use is one of the crucial point to achieve the 21 μA or less of sleep current. The following are the list of components on the Mini Ultra Pro that we need to take care of in order to achieve the low power current consumption in μA range. In this example, the RTC is configured to run in the background and an alarm is setup to wake up the microcontroller every 1 minute. Of course, this wake up interval can be configured as required by the application. The LED connected to pin D13 is toggle to indicate the sleep and wake up event. A Li-Ion/Pol 3.7 V is used to power the setup. Take note that a 15 s delay in the beginning of the example is defined to provide ample amount of time for user to upload code before the USB device module detaches itself from the host. Once the Mini Ultra Pro board goes into low power mode, the PC will not be able to detect the USB serial port of the board unless the reset tact switch is press. The measured current during sleep mode using the example code will result in 21 μA of sleep current. 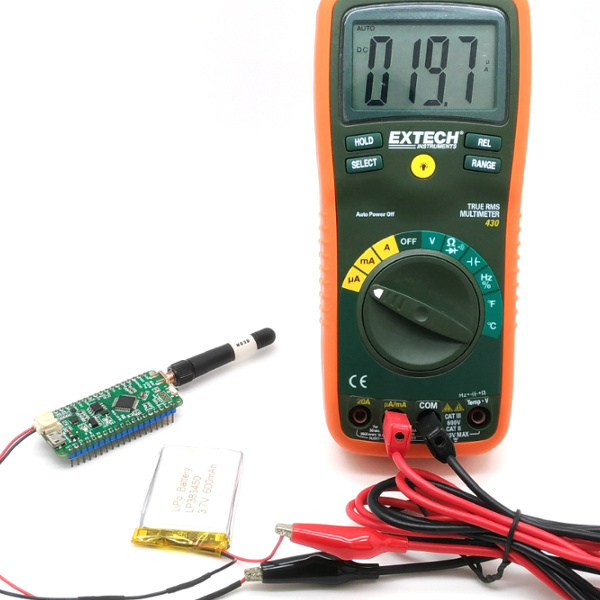 The bulk of the 21 μA is contributed by the on-board battery power management IC (BQ24074) but it is crucial to have a proper Li-Ion/Pol battery power management like the BQ24074 is avoid shorter lifespan of the battery due to unnecessary charge and discharge cycle. background. Alarm is set to wake the processor on the 15 s of a minute. current measured is approximately 21.0 uA. 1. 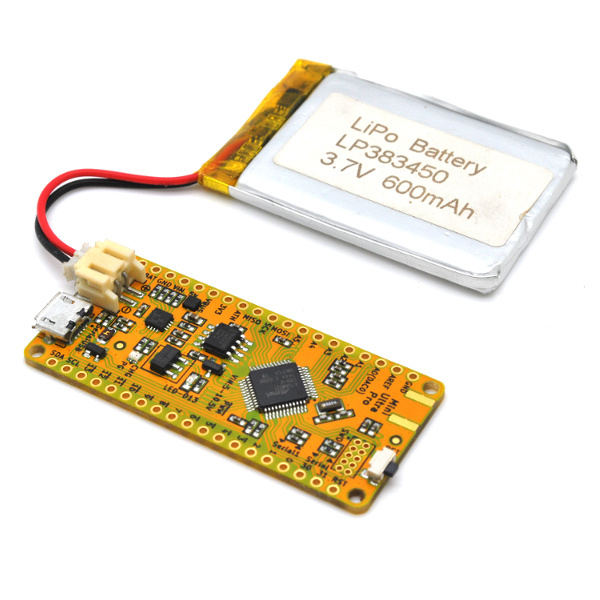 Mini Ultra Pro board powered by a single cell Li-Ion/Pol 3.7V battery. serial flash chip response to is SerialFlash.wakeup().